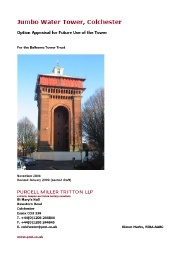 In July 2008 Balkerne Tower Trust commissioned an Options Appraisal for public uses of Jumbo from Purcell Miller Tritton, who had produced a similar study for Colchester Borough Council in 1996. This work was completed in October 2009. It was part funded with the kind support of the Colchester and North East Essex Building Preservation Trust. Why only 'public uses'? Because, following expert advice, we made the assessment that no viable commercial development of this Grade II* listed building was possible. A subsequent admission by developers to this effect, after exhaustive investigation, has confirmed this assessment. Here is a short summary of the Options Appraisal (pdf. Opens in new window). To download a copy of the complete Options Appraisal report please click on the image opposite (pdf, 18.4Mb. Opens in new window).